It’s not often that you see a baseball game postponed the day before the game. It’s even less often that two baseball games are postponed the day before the game, but that’s what happened yesterday when today’s Mariners-White Sox and Padres-Cardinals games were called early. Saves me some work and saves anyone debating whether or not to use those players for their fantasy lineups the hassle. I like it. 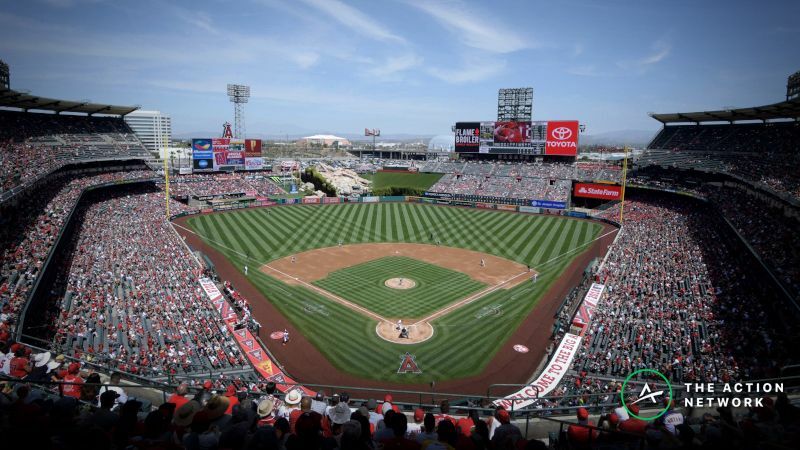 You may notice that the wind is blowing out in Anaheim … or Los Angeles … or wherever the heck the Angels play. This is true. However, this is often the case. Unfortunately, this does not provide us with an edge. In fact, it’s been rather unprofitable to take overs at Angel Stadium when the wind has been blowing out. The over/under has gone from 8 to 8.5 since opening for tonight’s Rangers-Angels game, but if you’re taking the over, I hope it’s for a reason other than the wind. Weather Ratings are a proprietary number created by FantasyLabs which are on a 0-100 scale, with 100 being the best hitting atmosphere and 0 being the best pitching atmosphere. It takes into account temperature, wind speed, wind direction, stadium elevation, humidity and atmospheric pressure. Ooohhh 35, I’m really scared. The best baseball weather today is still not good. We’ve still had only a couple of games all season (aka the past week) with above-average hitting conditions. Both of these over/unders have actually fallen a half-run since opening, with Cubs-Braves down to 8.5 and Sox-A’s down to 8. It might be the “best” weather of the day, but it still ain’t good. We don’t have any temperatures in the 30s today, but the weather is still largely crappy around the country, especially in the Ohio Valley area. Cleveland, which recently posted a Weather Rating of 2, is right back at it with a rating of 7 today against Toronto. Temps will be in the low-to-mid 40s and a stiff 10-mph breeze will be blowing from the right field foul pole toward third base. With this forecast and Trevor Bauer going for the Indians, the over/under has dropped from 7 to 6.5 since opening. There will also be dreary conditions in Detroit, where the over/under has also dropped a half-run since opening (from 8 to 7.5). The winds are somewhat flipped at Comerica, where they’ll blow in from left field, but overcast conditions with temps in the low-to-mid 40s will be present. It’ll be nearly 10 degrees warmer in Pittsburgh, but once again, there’ll be winds blowing in from left with cloudy skies. After initially moving from 7.5 to 8, this over/under has dropped back down to its opener of 7.5. More than 70% of bets are on the over, but money is split.